Thanks to the RBC uOttawa CO-OP Entrepreneurship Program, arts students can give full rein to their potential for innovation! The result of a partnership between the CO-OP office and RBC, the program offers a $10,000 scholarship for a four-month placement, allowing CO-OP students to express their entrepreneurial spirit. This year, communications student Chantelle La Rue received one of these prestigious awards. It has allowed her to do a placement with a startup. Because of her flexible bachelor of arts degree, La Rue was able to take courses in various fields, including theatre, political science and administration. She was able to create a program based on her interests, in keeping with her career goals. Enrolling in the CO-OP program also allowed La Rue to gain hands-on experience, in addition to her university education. 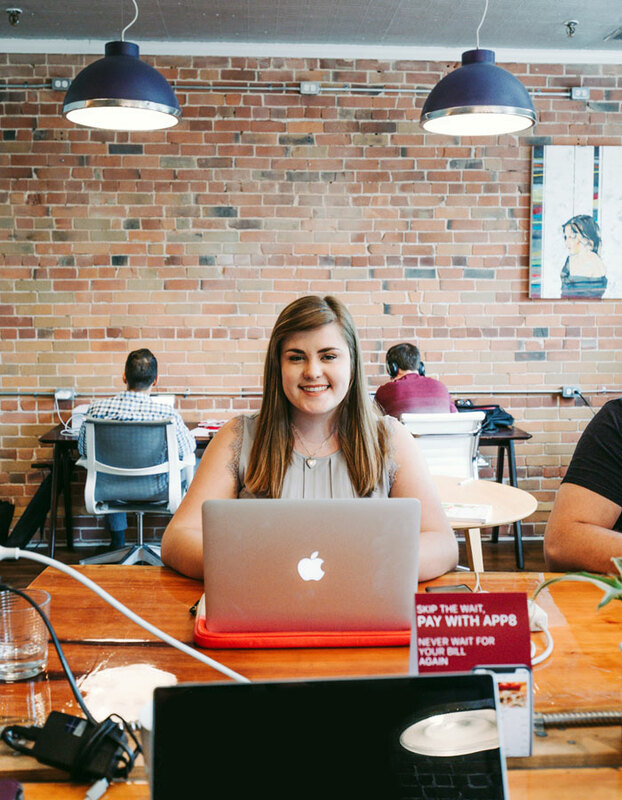 “I’d known for a long time that I wanted to work in a new business, but without the scholarship support, I couldn’t have done it.” The RBC program helps startups pay the salary of an intern. It’s a great opportunity not only for the student, but for the host company as well! APP8, the startup that recruited La Rue as part of the program, aims to improve the restaurant experience by allowing customers to split and pay the bill using their cellphones, without having to wait for the server. The company’s CEO, Elias Hage, is a University of Ottawa alumnus who quickly recognized La Rue’s potential. “Chantelle really stood out from the other candidates because of her social intelligence and her eagerness to learn,” he says. Although she has only been a member of the team for a few weeks, La Rue is already responsible for four projects and is helping Hage on the company’s marketing campaign. She hopes to see the company grow and learn more about the support system it has put in place. Hage is open about the fact that he would like La Rue to be a permanent member of the team. In the meantime, he might be able to keep her a bit longer. In addition to the initial scholarship, the RBC/uOttawa program allows students to receive an additional $5,000 to continue a project by working part time the following term. If, like Chantelle La Rue, you have dreams of entrepreneurship, consider adding the Entrepreneurship, Creativity, and Social Innovation option to your Faculty of Arts program.